I take part from time to time in the About.com jewelry making forum. Yesterday was St. Patrick's Day so a good few of the transatlantic members had posted something in honour of the day, something green of course. Having spent that day and half the previous one in bed, green about the gills, it was only today I got to post something green of my own. 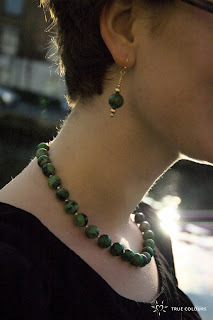 This is a necklace that drew a lot of attention at Showcase, being a stone quite close to emerald in colour. I was quite taken aback at how many people singled it out as their favourite, knowing that green denotes a need for space and direction - perhaps people are especially looking for those in the current economic climate? Green is also the colour of the heart, and there is a lot of green, so I am told, in Irish hearts. Just wandered by via the Europe Artfire Guild - your work is amazing - really beautiful.